So yeah...I'm O.C. like that. So yeah, I like buying stuff for my stuff....Jj (may laptop) doesn't have her accessories yet. She is using a laptop bag that is actually bad for my back. I want to get a skin, sleeve and bag for her. Can you say over protective? Hahaha For everything, I haven't found anything that I want. =( I really plan to get a backpack when I go to Vietnam in June so in the mean time, I need a sleeve to put Jj in my normal backpack. I've been around the cyberworld and Megamall but haven't seen a design that I LURVE, lurve. Then today, I saw one! I passed Jenni Epperson's blog and immediately fell in love. 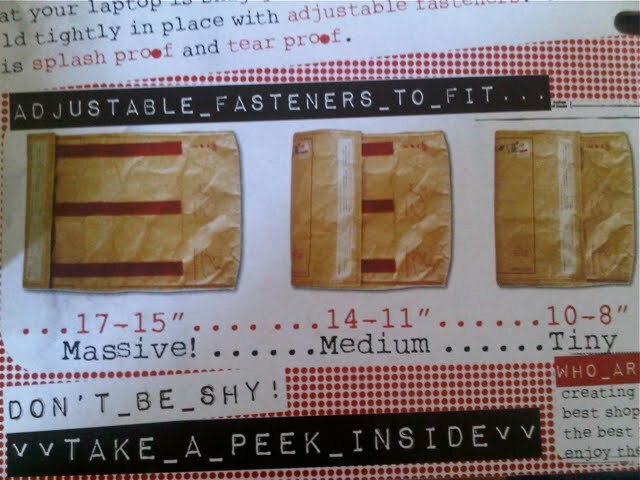 Luckies' Undercover Laptop Sleeve, P1,550 from Quirks in Powerplant.